As digital tools multiply and promise us ways to streamline tasks or better manage our time, it also can seem like they just add to our to-do lists. Some software systems could really increase your productivity by helping delegate tasks, and some email tools may actually help you spend less time mired in your inbox. But sometimes entrepreneurs need help in the form of tips that can be more easily implemented. If you’re looking for productivity hacks along this line, you’re in luck. The following three suggestions take no time to learn, don’t cost a dime, and can net you positive results ASAP. When you were in school, did you ever have a well-meaning parent prepare a hearty breakfast for you on the day of an important exam? It turns out good ol’ Mom and Dad were right on target. Not only do our brains require fuel in order to optimally function, but the quality of that fuel can also make or break your productivity. The World Health Organization even found that adequate nutrition can make a person 20 percent more effective. So without having to take a full course on nutrition, what can you do today to give your brain the TLC it needs to work better for you? Researchers have found that the presence of 25 grams of glucose in the bloodstream allows your brain to operate at its peak. To keep your blood glucose steady, the SurePayroll blog suggests snacking regularly on healthful foods like reduced-fat yogurt, hummus and bananas. You may be surprised by the brain power you get by making this easy fix, and how much greater the impact is than what you feel from your morning cup of java. In our digital-saturated, chaotic world, it’s not uncommon to hear people pride themselves on being “great” at multitasking. It’s almost as if they think advertising that they cram too many projects into too little time is appealing. The truth is, it’s not. Many studies have found that multitasking is not only ineffective, but it is actually damaging to the brain as well. It is time you stopped trying to have eight hands and endless eyeballs. The multitasking needs to end, for your own sake and the sake of your company. When it seems tempting to toggle between screens or write an email while you’re on a call, stop to remind yourself this is unhealthy and leaves you prone to errors. Instead of attempting to move simultaneously in multiple directions, give the Pomodoro Technique a try. You can actually order the company’s branded timer (and other collateral) to help you out, but it's not required. All you need is some sort of timer. The idea is to turn off your phone, close down your emails, and set the timer for 25 minutes. Spend that 25 minutes working on one task, and one task only. At the end of the time period, take a short break. Then return to the task and repeat until it’s complete. You’ll be amazed at how much more you can accomplish in a short amount of time, and how you'll feel more energized throughout the day. In order to work at the most efficient levels you can, your environment must be conducive to productivity. This can mean different things to different people, but ultimately it comes down to you working in comfort. Hopefully you have a good chair that supports your body ergonomically or—better yet—a standing desk and supportive shoes. Beyond this, the ambience matters. One study showed that people who were exposed to natural light remained on task 15 percent more than those who weren’t. Work by a window or, if this isn’t possible, use your quick breaks to pop outside and say hello to the sunshine. Also, be sure the temperature of your workspace is optimal. The optimal workplace temperature is somewhere between 70 and 77 degrees, according to several studies. If you and your coworkers have disputes over the thermostat, do what you can to ensure you’re comfortable anyway. Too cold? Bring a sweater or a space heater. Too warm? Keep a small fan on your desk and wear lighter fabrics. One final tip on comfort is to pay attention to your eyes. They get you through the long workdays, and need breaks too. Try subscribing to the 20-20-20 rule, in which you intentionally look 20 feet away from the computer for 20 seconds every 20 minutes. If this is too much to remember, just use your short breaks between Pomodoro Technique work bursts to look at something across the room. For those who are visual learner here's an infographic, produced by Salesforce, that'll further elaborate how to increase productivity in and out of the office. While you can spend a lot of time and money investing in tools that are meant to help your productivity, you often may not need to. Instead, try to do the simple things that make a world of difference. 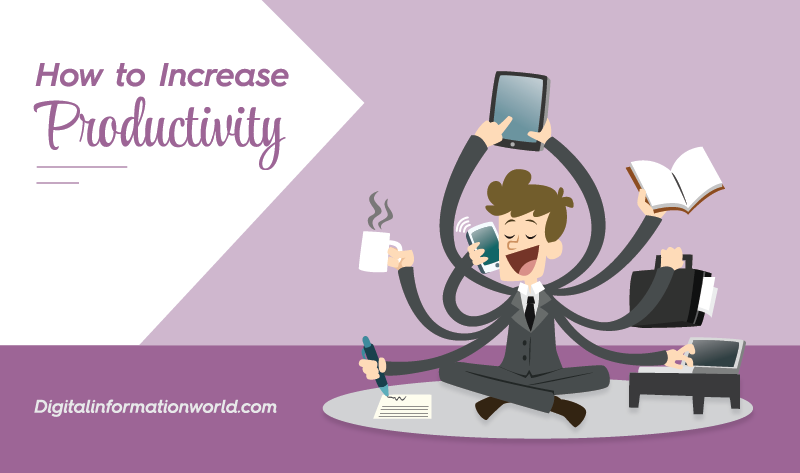 These simple tweaks can help you find your productivity stride and see powerful results.